Anti-hunger innovator and author Robert Egger will appear at Lindenwood University at 1 pm. on Wednesday, Feb. 20, as part of the school’s annual Sibley Day personal enrichment event. He will deliver the keynote address, “Rocking Life and Making Change: Championing Innovation for the Greater Good” in the Bezemes Family Theater, located in the school’s J. Scheidegger Center for the Arts. Lindenwood University's Historic Daniel Boone Home and Heritage Center has been named the recipient of a grant from the Missouri Secretary of State's Historical Records and Grant Program (MHRGP). The University will use the funds to purchase supplies for the preservation of several historical documents. The Lindenwood University Theatre Department will present the Arthur Miller's tragic tale “A View from the Bridge” at 7:30 p.m. on Feb. 7-9 in Lindenwood University’s Emerson Black Box Theater. Lindenwood University will host a traveling photo exhibit called “Remembering Our Fallen” from Tuesday, Jan. 15, through Monday, Jan. 28, in the Spellmann Campus Center. The exhibit memorializes the 140-plus military personnel from Missouri who have died from wounds suffered in a war zone since Sept. 11, 2001. On Nov. 2, 2012, the Missouri Department of Transportation closed the westbound span of the Blanchette Memorial Bridge at the Interstate 70 crossing of the Missouri River. Traffic in both directions will use the current eastbound span of the bridge while a year-long renovation project for the westbound span is in progress. Lindenwood University is pleased to announce it has received a scholarship grant through the Missouri Colleges Fund (MCF), which recently received a $20,000 donation from Edward Jones. 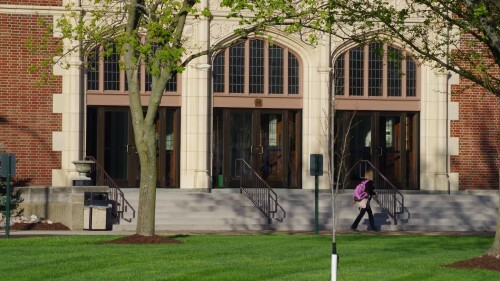 As an MCF member school, the university will receive a portion of those funds to award a scholarship to one qualified candidate majoring in business-related studies. For the third year in a row, students from the Lindenwood University School of Business and Entrepreneurship have been named the winners of an annual marketing competition sponsored by the St. Louis Chevrolet Dealers Association. A team of undergraduate students from the university worked throughout the fall semester to create a marketing segment for Chevy’s new Spark mini car, and the group’s entry was selected as the top prize winner from among several other St. Louis area universities. At the culmination of a four-year application and review process, Lindenwood University’s accelerated business programs have received accreditation from the Accreditation Council for Business Schools and Programs (ACBSP), the premier accrediting association for business schools and programs with a focus on teaching excellence. 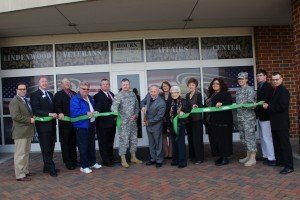 Lindenwood University hosted a ribbon-cutting ceremony on Nov. 15 to mark the launch of its new Veterans Affairs Center. The event took place inside the facility, which is located on the lower level of the Spellmann Center on the university’s St. Charles campus. Lindenwood University football player Sterling Thomas, 18, of Broken Arrow, Okla., was transferred Nov. 12 to Shepherd Center in Atlanta, Ga. Thomas sustained a spinal cord injury during a Lindenwood home game in St. Charles on Saturday, Oct. 27.